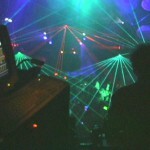 Laser Shows | Laser Spectacles, Inc.
A laser light show is not just a pile of expensive hardware operated by a technician. It is the end result of the laserist using the equipment, along with an acute visual sense and a highly developed aural sense, to create artistic entertainment in which “synaesthesia” (the coordination of sight with sound) occurs. Timothy Walsh is a multi-faceted artist with the vision to attempt this goal of synaesthesia. His aim is to create shows in which the audience is emotionally involved; and aided by his background, training and expertise, he is constantly striving to achieve this. Not only does he create beautiful images, he choreographs them to the musical accompaniment, working to create a whole that is greater than the sum of the parts. is an acronym for Light Amplification by Stimulated Emission Radiation. back and forth, creating a laser beam. The laser beam has three properties that make it suitable for a lightshow. colored rays above the audience. totally contained until they emerge to perform their intended effect. a more aesthetic show, as well as keeping safety first. create a brilliant “sparkle” of light at that point. rotating transparent object, such as a piece of “shower door glass”. the property of taking one laser beam and splitting it into many beams. This is an inexpensive way to multiply the power of the laser show. Clients requiring multiple shows can get discounts if the show remains in the same location. Projection… If laser graphics or logos are desired, a reasonably flat and light colored surface is required to project upon. A large white concrete wall is perfect. Laser Spectacles, Inc. carries outdoor projection screens made of Phifertex, sized 30 ft. x 20 ft. These screens can be tied onto a scaffolding frame, hung from a stage, or hung from pipes raised by a boomlift. The graphics screen will be the focal point of the show. It will provide the direction in which the audience will face, for which the beam show will be designed for maximum effect. Generally, none! Some lasers are cooled by water running through them constantly to carry off the heat produced by the lasing process. Standard garden hose fittings are preferred. Audience Control… Laser effects are legal as long as the beams are overhead. In most cases we mount the lasers upon a sturdy scaffold to raise the beams to a safe height (3 meters). In some cases a crowd control barrier and/or security guards will be needed to keep people out of restricted areas. 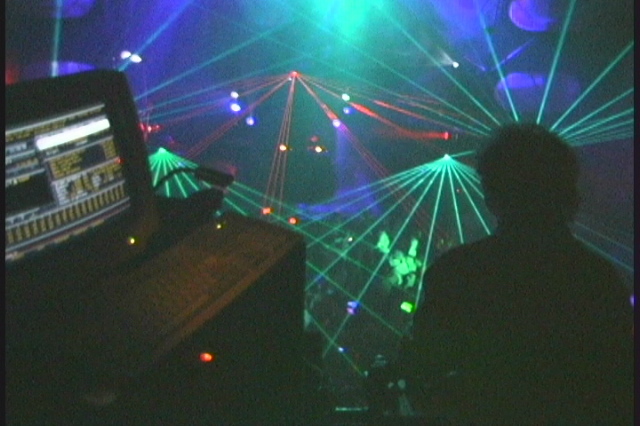 Time… Indoors, six to eight hours is recommended to allow for laser show setup. Outdoors, setup and testing one or two nights before the scheduled show is recommended.